Developing a sensitive microarray-based immunoassay was the aim of the partners working in WP4. Arrayon Biotechnology, situated in Neuchâtel, Switzerland, and technology provider of proprietary surface biofunctionalization technology created a movie to show more about the function and handling of the Inca Array developed in NanoDiaRA. On June 12, 2013, Swiss teachers were invited to EPFL to learn about the educational suitcase “Simply Nano” which aims to introduce pupils to nanotechnology. You can watch a short report about this event on the francophone Swiss TV channel. 7 November, 2012: "Nanomedizin: Ethische und rechtliche Aspekte"
26 September, 2012: "Nanopartikel: klein, anders und nützlich?" 23 May 2012, Lausanne: "Nanoparticles in Medicine: Toxicity Methods and Standards"
19/20 April 2012, Berlin: "Nanomedicine: Visions, risks, potential"
- "Nanomédecine, un rêve ancient, une réalité nouvelle?" - "Nanoparticules de fer: nouveaux horizons en imagerie médicale"
Bad Neuenahr-Ahrweiler, 12 December 2011. – NanoDiaRA, an EU-funded research project on diagnostic by using nanoparticles, and the Adult Education Center Bern recently organized a tripartite course of lectures about “Nanomedicine”. It covered many issues ranging from production to medical applications and ethical aspects. The first lecture was held by Professor Heinrich Hofmann (Powder Technology of the Ecole Polytechnique Fédérale de Lausanne), partner of NanoDiaRA and responsible for the nanoparticle synthesis and characterization in the project. He gave an introduction to the principles of nanotechnology and explained the very basics of the physical and chemical properties of nanoparticles and the technical challenges of their fabrication. Hofmann showed how nanoparticles can be used practically and explained their main fields of application in medicine. He also mentioned the potential risks of nanoparticles in the human body mainly appearing when nanoparticles in higher concentration are used e.g. as “trendy” nano-labelled products when it comes to textiles, household goods or food. The second part of the series dealt with “Medical application of nanoparticles”. In the course of the so-called “Saturday University” three speakers presented an overview of the medical fields in which nanoparticle research is conducted. Dr. Margarethe Hofmann-Amtenbrink, MatSearch Consulting Hofmann and scientific co-ordinator of NanoDiaRA, gave an overview of nanomedical research in Europe. She presented various European research activities for the treatment and diagnosis for diseases and summarized promising methods like immune tests and imaging techniques, using NanoDiaRA and other projects as examples. Dr. Christophe von Garnier, pneumologist at the Insel Hospital Bern, highlighted the latest results of the effects of nanoparticles on the immune system, in particular on the lung. This very complex research field still leaves open questions about the interaction of nanoparticles and the organism. Von Garnier´s work on the reactions of the lung and the immune system initiated by technologically used nanoparticles, promises to have an impact also on future applications of such particles in medicine. Professor Daniel Rüfenacht (Hirslanden Clinic Zürich) presented the research in hyperthermia for cancer treatment. By using larger amounts of ferromagnetic nanoparticles, rapidly changing magnetic fields can cause local heating. As tumors, compared to other tissues, are more sensitive to heat, tumor cells can selectively be damaged by this mechanism. Actual developments try to minimize side effects of a free distribution of nanoparticles by using them only in a polymeric implant and by optimizing the properties of nanoparticles to improve their interaction with the tumor. If successful, a significant improvement of tumor treatment using particles could be expected. The final talk of the course of lectures was dedicated to the ethical aspects related to nanotechnology and nanomedicine. The talk was given by NanoDiaRA’s co-ordinator Priv.-Doz. Dr. Felix Thiele (Europäische Akademie Bad Neuenahr-Ahrweiler, Germany). Thiele outlined the basic ethical questions that are raised by new medical techniques like nanotechnology. Introducing fundamental philosophical distinctions such as ethics vs. morality and concepts of responsibility, risk and justice, Thiele gave an overview of current philosophical discussions in the field. In the end the talk was followed by a discussion with the audience on ethics of science and new technologies. The outcome of this successful course of lectures will be summarized in a brochure for the public, available on www.nanodiara.eu in spring 2012. The three sessions, organized by Alessandra Hool, MatSearch Consulting Hofmann, took place in November and December 2011, in Bern, Switzerland. Bad Neuenahr-Ahrweiler, 18 November 2011. – This year's Ahrtal talks involved chances and risks of "nanomedicine" and the question which new developments nanomedicine may offer to bring forward medical progress. Guido Orthen, mayor and chairman of of the sponsors’ club of the Europäische Akademie and host of this event, and Professor Dr. Dr. h.c. Carl Friedrich Gethmann welcomed the guests and the two speakers, Professor Dr.-Ing. Heinrich Hofmann and PD Dr. phil. Johann S. Ach, in the city's council hall. Gethmann introduced to the subject, pointing out that nanotechnology already had a certain "history" in the Europäische Akademie as there had already been several projects dealing with this matter. Currently, the Europäische Akademie is co-ordinating the EU-project "NanoDiaRA", a project dealing with nanotechnology based diagnostic systems for Rheumatoid Arthritis and Osteoarthritis. Heinrich Hofmann (Eidgenössische Technische Hochschule Lausanne) first explained that there were different competing definitions of "nano". According to his explanations, "nano" did not only mean "small" particles (less than 100 nm), but was also supposed to distinguish specific innovative properties of nano-scaled materials: properties which were hoped to be of use for efficient, safe and affordable medical treatments. Nanotechnology was supposed to be applied in diagnostics, therapy and prevention and could foster the trend towards a personalized medicine. Hofmann also explained that the risk of using nanoparticles in medicine was especially related to their possible toxicity which, however, was not considered as too high: Nanoparticles would be used controllably and for particular purposes only. Other than in clothing or food, for instance, their medical use would be local and controllable. In the test procedures, nanoparticles were examined like drugs, and to test their suitability, highest safety requirements would be implemented. Though he conceded that there were still no long-term studies and that scientists from different faculties repeatedly had communication problems when nanotechnology was concerned. Johann S. Ach (Westfälische Wilhelms-Universität Münster), second speaker of the evening, approached in particular the ethical assessment of the new technology, stating that there were several ethical problems relating to the use of nanotechnology in medicine, namely matters of data protection, possible ensuing discrimination and political issues, because one could not say whether such treatments would be equitably available for all patients. Moreover, one should keep a wary eye on the possible application of nanotechnology-assisted medical developments in non-medical fields such as, for instance, for military purposes. As furthermore exploration of risks of medical use of nanoparticles was still not finished, there was still a lack of formulation of questions and measuring instruments, Ach stated. Cultural and anthropological aspects such as a new comprehension of disease and health and impacts on human self-conception (for instance in connection with "human enhancement") had also to be taken into account for an assessment. According to Ach, adoption of a consistent terminology would be particularly important to solve these problems. Moreover, an optimum risk assessment and profound ethical reflections regarding any possible application fields should be basic prerequisites. During the subsequent discussion between the speakers and with the audience, lead by Gethmann, it was stated that nanotechnology was only applicable to a few treatments so far, as its development was still in progress. In this connection, Hofmann underlined that in his opinion it was therefore not yet time for an ethical assessment, whilst Ach would start with ethical assessment right from the beginning. The speakers agreed that debates on medical application of nanotechnology had revealed that all parties concerned had perceived the risks and that outside of actual medical application there was a need of clarification as to human self-conception and the doctor-patient relationship. The series of events of Ahrtal talks of the sponsors’ club of the Europäische Akademie GmbH brings research in the field of ethics and assessment of technical consequences and practice together and discusses controversal topics. 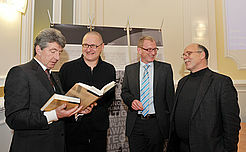 This year's Ahrtal talks of 16 November 2011 were in addition sponsored by the EU-project NanoDiaRA (www.nanodiara.eu) which is coordinated by the Europäische Akademie. Scientists of NanoDiaRA and other speakers present in this course of lecture various aspects of the medical application of nanoparticles. Nanoparticles are mostly seen as dangerous today. This is legitimate to a certain extent, as there are in fact toxic effects of some particles in the nano-size. Controlled production and use of these particles, however, offer new and interesting applications: Nanoparticles have inimitable properties which do not appear in other materials. To use these is the goal of modern material research. In this lecture, some new properties of nanoparticles are observed and their potential for application in diagnosis and therapy is discussed. The event in the framework of the "Saturday University" of the Adult Education Center addresses different application fields of nanoparticles in medical research: Early detection of rheumatic deseases in NanoDiaRA, exploration of possible damaging effects of nanoparticles in the lung at the Inselspital Bern, and the detection and distruction of tumors at the Hirslanden-Klinik Zurich. Rheumatoid arthritis belongs to the auto-immune diseases, for which the treatment has improved in the last years. For arthrosis, however, there is no curing therapy so far. For an effectful treatment of both diseases, an early detection is necessary as well as the possibility to monitor the curing process. Researchers and clinicians from Europe coming from nanotechnology, biology and rheumatology therefore focus in a European research project on the development of a new, nanotechnology-based diagnosis system for rheumatoid arthritis and arthrosis for the development of early detection methods by radiology and biotests, among others with new biomarkers. In both cases, nanoparticles are used, whose benefits and acceptance by patients and physicians shall be displayed as well. Despite intensive research in the field of nanomaterials, which are partially already on the market, there are still many open questions about the interaction of nanoparticles with the organism. The lung is the most important point of entry for nanoparticles, where these can affect the immune system through interactions with the lung cells. Health problems, caused by nanoparticles in the environment (fine dust), are known. If, however, therapeutic nanoparticles affect the health negatively, is subject of actual intensive research. The talk shall give an overview of the newest knowledge of the reaction of the lung and the immune system on nanoparticles which can be used in medicine in the future. In the context of actual and upcoming promising medical applications in tumors, nanoparticles can be used for a better displaying and treatment. Ferromagnetic nanoparticles accumulated in the tumor tissue lead to sensitive changes in the behaviour of the signals in magnetic resonance imaging, allowing the detection of such particles in medical imaging by magnetic resonance even in small amounts. Small tumor lesions can by this specifically be detected. By using larger amounts of ferromagnetic nanoparticles, rapidly changing magnetic fields can cause a local heating of the nanoparticles of any time span. As tumors, compared to other tissue, are more sensitive to heat in principal, tumor cells can selectively be damaged by this mechanism of moderate heating.For both medical applications in tumor treatment, the precise insertion of nanoparticles is necessary. Actual developments try to optimize these processes and principles. If successful, a significant improvement of tumor treatment using particles can be expected. Why do we need science ethics in general and ethics for nanomedicine in particular? Which possible scenarios of the development of nanotechnology are possible in the foreseeable future? What is the difference between nanomedicine and other modern medical diagnosis and treatment techniques – is nanomedicine something completely new or only a further step of science on its way to more complex technologies? Besides these questions, the talk addresses the moral problems raised by nanotechnology, like questions of naturaleness, risk assessment and the dangers for humans and the environment. Margarethe Hofmann-Amtenbrink (MatSearch) participated at the public discussion at the "Apéritif scientifique" on October 26, 2011 in Lausanne. Film: Margarethe Hofmann-Amtenbrink on "nanomedTV"
The Department of Clinical Sciences at Lund University, partner of the NanoDiaRA consortium, held a workshop on nanomedicine at AF-borgen in Lund on 6 September 2011. It was organised by the Neuronano Research Center at Lund University, SPAGO Imaging and Nano Connect Scandinavia. 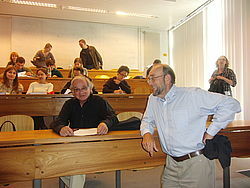 On Friday, 26 November 2010, the first NanoDiaRA Seminar on “Science meets Society” took place at the University Campus in Zurich. Interested people from the University of Zurich, the Swiss Federal Institute of Technology, Zurich, the University Hospital of Basel, the Paul Scherrer Institute and representatives from Nanotech companies participated in this event. As Margarethe Hofmann, scientific coordinator of NanoDiaRA, explained, the NanoDiaRA project deals with very complex fields in the early diagnosis of arthritis. Many different disciplines have to work together having in mind nanotechnology-based products which are safe for the patients as well as for people handling such nanoparticles. Therefore, it is the aim of the NanoDiaRA consortium to inform the society as early as possible and to get feedback on their actions. NanoDiaRA science is there to help patients (in Canada also known as consumers, as Professor em. Robin Poole explained). As a scientist and Professor Emeritus at McGill University in Montreal and a former Scientific Director of the Canadian Arthritis Network (CAN), he was engaged in pioneering the involvement and meeting the challenges of having patients/consumers involved in a research network. There were and there still are obstacles to include consumers, often suffering from disabilities and much pain, in the day-to-day strategy and in decision-making processes of research and its management. However, CAN has shown that the opinions and the information of these consumers are of great value for the research and knowledge dissemination programmes of CAN. During the last twelve years of CAN’s activities, the expert CAN Consumer Advisory Board, developed during CAN’s tenure, has become more and more part of the overall daily work operations on every committee. Even governmental departments in Canada now take recommendations of these consumers very seriously, often preferring to listen to the consumer´s voice rather than to many different professional opinions. Thereafter, information about nanoparticles and their applications in pre-clinical diagnostics and research were the topics of three presentations. Professor Jean-Paul Vallée, a radiologist from the University Hospital of Geneva, described various research activities for early diagnosis using different nanoparticles already on the market such as gadolinium or iron oxide based contrast agents used for detecting liver cancer. Nanomaterials on which such contrast agents are based are Professor Heinrich Hofmann´s field of research (Swiss Federal Institute of Technology in Lausanne). His aim is to develop safer iron oxide nanoparticles which show more reliable properties and lack toxicity, both in vivo and in the environment. Furthermore, they should be tailored so that they can be specifically targeted not only to certain tissues but also to specific cells and cell compartments to improve early diagnosis of arthritis by MRI. Nanotechnology and the development of nanoparticles are state-of-the-art and almost everyone in society assumes that after so many years of research there must be enough knowledge about nanoparticles and their behaviour in humans. Professor Brigitte von Rechenberg, Veterinary Faculty of the University of Zurich, described her collaborative pre-clinical work together with Hofmann´s group in another EU-funded project. There, she used different kinds of iron oxide nanoparticles to examine the body’s response to particles with different coatings and thereby different properties in health and inflammation. It was concluded that the development of nanoparticles in the field of nanomedicine will only make sense with a targeted goal, a targeted application and the knowledge, the expertise and the network of medical doctors, engineers and scientists. Furthermore, the involvement of pharmaceutical companies which are able to transfer such multidisciplinary research into a product for the patient/consumer is needed, too. The EU-funded NanDiaRA project offers all these ingredients. Professor Robin Poole at his talk on Thursday afternoon with Professor Emeritus Jean-Michel Dayer of Geneva university. The 1st NanoDiaRA summerschool, which is part of the EU funded FP7 research project on Novel Nanotechnology based Diagnostic systems for Rheumatoid Arthritis and Osteoarthritis, took place from September 6 to 10 2010 at the Swiss Federal Institute of Technology (EPFL) in Lausanne, Switzerland. This nanotechnology summerschool has been designed to promote learning in the broad field of nanoparticles and diagnostic tools, and to foster discussion and exchange of ideas. The NanoDiaRA summerschools are open for all graduate students and post doctoral students. About 50 participants from EPFL, the NanoDiaRA Consortium and external universities and institutions were interested in listening to several basic and more technological-driven lectures about «Nanoparticles for Biomedical Applications». Specifically, this summerschool was organised to inform about nanoparticle synthesis, coating steps, functionalisation with biomolecules and the characterisation steps which are necessary to provide the end-user with all data about the nanoparticle properties. Furthermore, the applications of such nanoparticles were discussed such as use in biomarker assays. A second field was the in-vivo application for which these particles are proposed to serve as contrast agents in diagnostic applications like magnetic resonance imaging or even as a drug delivery tool. In all such applications, the safety of the people working with such particles and those receiving these particles during diagnosis or therapy is one of the important issues and was also a topic of the summerschool – from an ethical point of view and from the experimental one, using animal experiments to examine biocompatibility and/or toxicity. Experts mainly from the Consortium NanoDiaRA presented the courses and discussed their work with young investigators. Apart from the interesting and comprehensive basic information about nanoparticles and nanotechnological applications in medicine, Professor H. Hofmann (EPFL, Powder Metallurgy Laboratory) made a clear distinction between goals that can realistically be achieved and speculative future visions of nanomedical tools from the scientific view. He explained the various steps involved in nanoparticle production. Dr. P. Bowen, from the same laboratory, gave detailed information about the various methods of particle characterization. The lecture of Professor J.-P. Vallée (University Hospital of Geneva, Radiology Department, Switzerland) focussed on the physics behind the imaging and its fundamental importance to achieve excellence in nanomedical issues in magnetic resonance imaging. One of the research tasks of NanoDiaRA will be the development of novel nanoparticle-based contrast agents to improve contrast in the detection of inflamed tissue structures. An impressive overview of the importance of safe handling in the case of these risk-associated methods in the laboratory was given by Professor A. Fink (University of Fribourg, Chemistry Department, Switzerland). She showed the current problems and the urgent need for regulating and improving actual safety conditions for researchers in the field of nanoparticle development. Priv.-Doz. Dr. F. Thiele (Coordinator of NanoDiaRA from the Europäische Akademie zur Erforschung von Folgen wissenschaftlich-technischer Entwicklungen Bad Neuenahr-Ahrweiler GmbH, Germany) stated that applied ethics has to be integrated as an essential tool for responsible planning and research in the field of nanoscience. Performing risk assessment and risk benefit analysis and establishing risk levels for a reasonable regulation involves balancing (possible) opportunities and (potential) risks of using nanosized technology in diagnosis and therapy, to avoid toxic impact on humans and their environment as well as raising risk perception. Dr. H. Sigrist (CTO/CSO of Arrayon Biotechnology SA, Neuchâtel, Switzerland) presented bioassays which are typically conducted to measure the effects of some substance or activity, such as a disease,on biomolecules, cells or living organisms. Such bioassays reveal the bioactivity of the substances tested as well as their potency in interacting with living matter. He mentioned the label-dependent detection to which belong fluorescent and also magnetic particle-based assays and label-free détection, e.g. surface acoustic wave sensors. Major applications of assays are in-vitro diagnostics, drug discovery (HTS) and clinical research. Altogether, the summerschool provided an impressive overview of the wide range of topics with which nanotechnology specialists are involved. The second NanoDiaRA summerschool will take place in about one year’s time at the University of Lund, Sweden covering all the features of cell and molecular biology related to inflammatory diseases like rheumatoid arthritis and osteoarthritis. Again, the involvement of external researchers and trainees will be very welcome. Find more news in the news archive. Priv.-Doz. Dr. med. Felix Thiele, M. Sc.